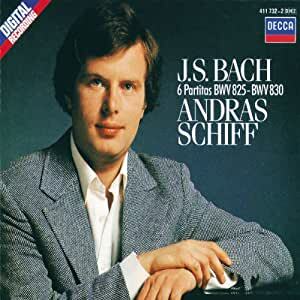 For 40 or more years Andras Schiff has made Bach piano composition his own. There is no one who excels at Bach better than he - with no use of pedal and complete memorization of the scores. I have been to at least 4 concerts and love being able to reproduce most of the experience with a CD. It's odd to see the young face on this CD cover after having just been to a concert of the more mature man. I could only wish that there were recordings at each of his decades, as the music performance has changed with time. 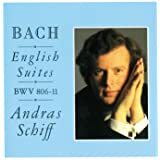 The Partitas for keyboard take on new warmth when Andras Schiff plays them. In these days of fast, mechanical, performances with emphasis on diction, the partitas tend to lose their dancelike charm. Schiff uses tasteful ornamentation, and a modest amount of rubato. But it is the genuine emotion and sensitivity that make his performance exceptional. I found this recording of #1 absolutely captivating--it's the kind that leaves me humming the melodies long after the recording is done. 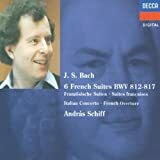 Andras Schiff has recorded most of the famous Bach keyboard repertory to international acclaim. I believe this was his first recordig of all six partitas and it came after his initial recording of Bach's Partita No. 5 .His newer set is an improvement over this one. I haven't heard all the sets extant of this music but, of the ones I have heard, I'd recommend Glenn Gould over this one, assuming you can live with one in mono sound and others that aren't state of the art. 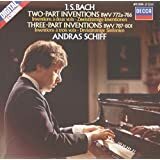 There are also commendable sets by harpsichordist Igor Kipnis on two discount CDs -- Harpsichord Partitas 3 5 & 6 and Harpsichord Partitas #1 #2 #4. No. 1 by Dubravka Tomsic, a student of Artur Rubinstein that doesn't have a large discography. No. 2 by Roselyn Turek from her Live in St. Petersburg CD (ASIN: B000009LO2.) Turek, also known as the high priestess of Bach, is one of the most unique Bach players ever. No. 3 by Kristina Svanberg , a virtually unknown Swedish teacher that has the measure of this most difficult partita and its applied rubato. No. 4 by Glenn Gould either in his set or his old Odyssey recording, both times in songful stereo. No. 5 by Schiff in his first attempt. No. 6 in Elena Kuschnerova's titanic concert recording that The Penguin Guide graded with a rosette when new in 2006. I put this set together for my own use at home and have never regretted it, regardless of the number of new or old Bach partita sets I've heard. Essential, I got my copy at the famous Portland record store. Music Millenium. A fantastic album True to the essence of the music beautifully executed with great sensitivity and a sense of movement remembering that these pieces are dances .